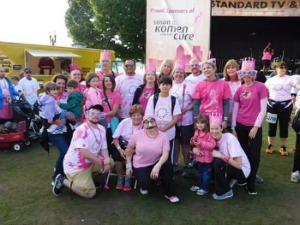 Summit Chiropractic & Massage of Vancouver was very happy to attend the 2015 Susan G. Komen of Oregon and Southwest Washington Race for the Cure this last September. We walked with one of our very own, Adrienne Ann and her family, in support of their journey through breast cancer. We want to thank each and every one of our amazing patients that came to contribute to that support. Our greatest wish would be that this awful disease did not exist, but the fact of the matter is it does. Not only does it exist, each year globally over 14 million people learn that they will have to battle cancer. This is a staggering thought in itself. As we arrived in the early morning of the event, what struck me was the pure joy that was in the air; you could literally feel the excitement, encouragement and love all around. I found myself thinking, “These people are sick? How are they SO happy?” The answer is simple, hope. Hope for Today, Hope for Each Other, Hope for the Future. I was amazed. We are so very proud of you Adrienne, proud of the fighter that you are, proud of the amazing spirit that just overflows into every aspect of your life, and as we watched you take the stage to share your story of hope to these amazing survivors, I was overcome with the same hope that they have, for an answer. But while they wait, we pledge to wait with them, in hope for a cure. I too have been blessed by Adrienne Ann's sweet spirit and determination to encourage others in their journey--whether they have cancer or not! Praying that she beats this!